My father is old school - doesn't know much about the internet and the power to reach millions of potential clients across the United States. I have a Bachelor's degree in business and marketing and had spent several years in sales prior to starting JARS Labradoodles. I knew nothing about building a website but I taught myself and I feel like I've done a decent job with giving potential customers what they want to see. What I learned very quickly is that my potential clients demand transparency when it comes to health testing data. A lot of breeders will list the health testing data, but don't show actual proof. I did the same thing when I first started my website until I discovered Paw Print Pedigrees. I appreciate that Paw Print Pedigrees allows me to link my clients directly to the source, all while co-branding through the use of the Paw Print Genetics logo. Another thing I try to use to differentiate myself as a breeder is personal attention to each and every client – starting with the very first phone conversation. I want to know as much as I can about my clients and I’m sure they want to know more about myself and my breeding program. At the end of the day, it’s all about trust. Which leads me to the point of this long letter. Words cannot express how much I appreciate the service and personal attention I receive when doing business with Paw Print Genetics. I used to use other laboratories. I've tried to call these laboratories to discuss test results - very frustrating to say the least. How Paw Print Genetics treats me is second to none. When I call I feel like people know my name, especially Dr. Casey Carl. I would like to recognize his efforts and amazing customer service. He ALWAYS takes the time to talk with me, help me understand test results, and even talk breeding strategy based on test results. I will never forget one thing in particular. I had placed an order back in December for multiple dogs. I had a female come into season and she progressed much quicker than I had anticipated. I wanted to breed her to my new stud but couldn't do that unless I knew the results of the stud's tests. I called and spoke to Dr. Carl earlier in the week and he agreed to expedite the testing and expected results by the end of the day Friday. I can't remember exactly what had happened, but when I spoke to Dr. Carl Friday afternoon he explained that he did not have any results but promised that he would have them to me before he left the office. He also promised to call me to let me know everything was completed. So - at 9:30 p.m. Eastern Standard Time on the Friday before Christmas, Dr. Carl calls me to tell me everything was finished and that he had stayed to make sure the reports were delivered. I am just one client - but your company and its’ employees, specifically Dr. Carl, make me feel like I am your most important client. 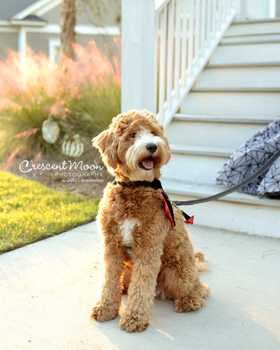 I promise you one thing - when it comes to genetic testing, Paw Print Genetics will get all of JARS Labradoodles’ business. Please let me know if there is anything I can do to help attract more customers for you.